In our book and often in our talks we discuss a technique for thinking through and documenting detailed interactions in a user experience. Just arrange the interesting moments in a grid. 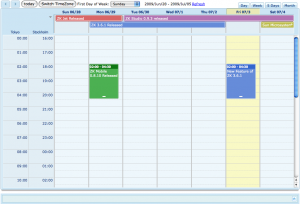 List the “actors” (user interface elements) vertically and the events horizontally. The cells in the grid become the interesting moments. About a month back I gave a talk at Zurb, a northern California design firm, in which I discussed this technique. On Friday I was pleasantly surprised to see they had already taken the idea and used it in a new product they announced last week — BounceApp — which was featured on TechCrunch. Look for the upcoming post (Thursday, Dec 10) in InsideRIA.com about 28 Rich Data Visualization Tools. I’ve included the first three to whet your appetite. AnyChart is a flexible Flash based solution that allows you to create interactive and great looking flash charts. Axiis is a Data Visualization Framework for Flex. It has been designed to be a concise, expressive, and modular framework that let developers and designers create compelling data visualization solutions. Also, take a look at the nice window-in-window design on the saturnboy blog. I saw Todd Warfel speak in August at DELVE UI. I was so inspired by his approach that I changed the way we work. We have now moved away from large decks of wireframes and interaction notes- and embraced the 70% rule. We design 70% then build a prototype. There are a number of examples in my talk Designers vs Developers: Coming together to build the best RIAs. But the point is, if you are designing Rich Internet Applications, RIAs, prototyping is essential. View more presentations from Todd ZakiWarfel. And consider getting his new book, Prototyping: A Practitioner’s Guide to Prototyping, Rosenfeld Media, November 2009. It is full of practical advice and detailed examples, not philosophical musings. If you are like me- a busy consultant who is not a great programmer, but needs to get interactive mock-ups in front of stakeholders as fast as possible- there are a number of great ideas in here. I posted this on my personal blog and according to slideshare it is the top tweeted presentation from their site today (9/20/09). Been meaning to post it here for those who don’t follow my blog. The material contains some new examples but tracks with the book’s six principles. I recently gave this talk at Microsoft for their UX team, at the Ruby Meetup Group at the CMU campus in the bay area and most recently at the Ajax Experience in Boston. Next time I will be giving this talk is in December at the Rich Web Experience (first week of December) in Orlando, Florida. 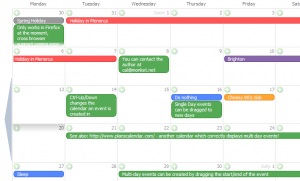 Last week I needed to find a robust Ajax Event Calendar, similar to iCal or Google Calendar. After hours of searching, I realized this was more difficult than it should have been. 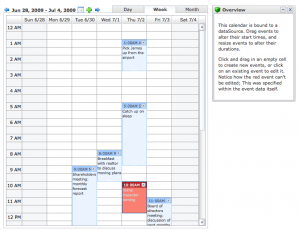 It appears a number of Ajax event calendars were prototyped in 2005-2007 but never matured. Many of those links are broken or useless today. And, when you search for Ajax calendar, most of the results are actually date pickers- not full blown scheduling components. 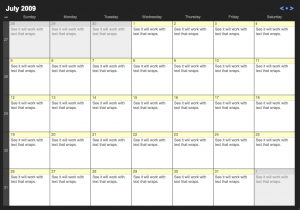 I would modify the interaction in this calendar to open the event scheduling and editing in the same screen as the calendar (in a dialog or slide in panel). 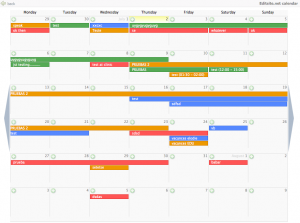 It is cumbersome to have to navigate back and forth to the calendar screen. I also wanted to mention a calendar available for download called MooMonth, obviously in connection with MooTools. If someone would pick it up and finish adding the event scheduling capabilities, this would be a very nice event calendar.